Joloj is an endeavour by artists Al-Akhir Sarker, Biplob Chakr oborty, Golam Moshiur Rahman Choudhury, Md Azmal Uddin, Sadek Ahmed and Shaymal Biswas. Alliance Française de Dhaka (AFD) organizes a group painting exhibition titled Joloj 4 (Aquatic 4) - ‘Street of Dhaka’ at its La Galerie in the capital’s Dhanmondi area. The inaugural ceremony of the exhibition is scheduled to be held on November 9. 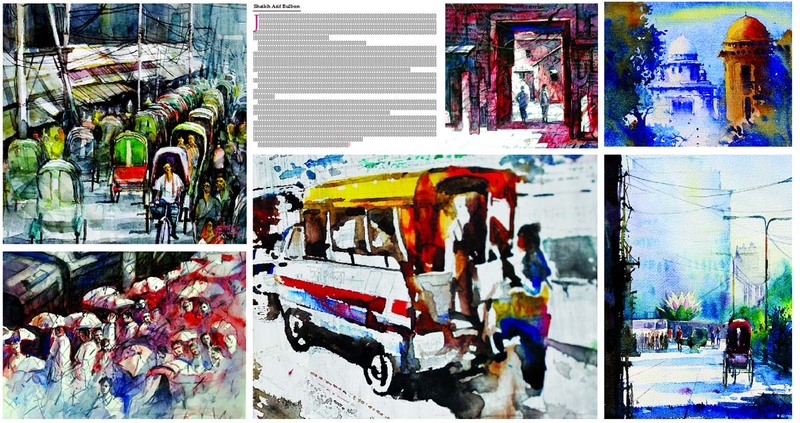 The streets of Dhaka also prevail in Biplob Chakroborty’s paintings. A rickshaw without its puller or a bustling street - Chakroborty’s characteristic use of shade and darkness stands out. Golam Moshiur Rahman Choudhury’s paintings depict rickshaws and vehicles of Dhaka awash in rain as well as in a distinct ‘megalopolitan’ luminescence, with spirited colours and shadows. Rickshaws, people or pedestrians and streets of Dhaka come into the paintings by Sadek Ahmed, albeit a bit dramatically in contrast to his fellow participants. Ahmed also inscribes letterforms in the secondary spaces to perhaps guide his observers by employing artful vignettes. Shaymal Biswas’ lens goes closer to his subjects as if zooming in to understand a profound angle. You find a part of the street and an intimate one at that.